Happy Thanksgiving everyone. My last day of freedom before work cycles up again was action packed. My wife ran her forth half marathon this morning. Go Annabelle! This afternoon, Paul headed over for another rivet party.We knocked out more of the side skins and went back to get all the interior rivets that needed to be bucked. 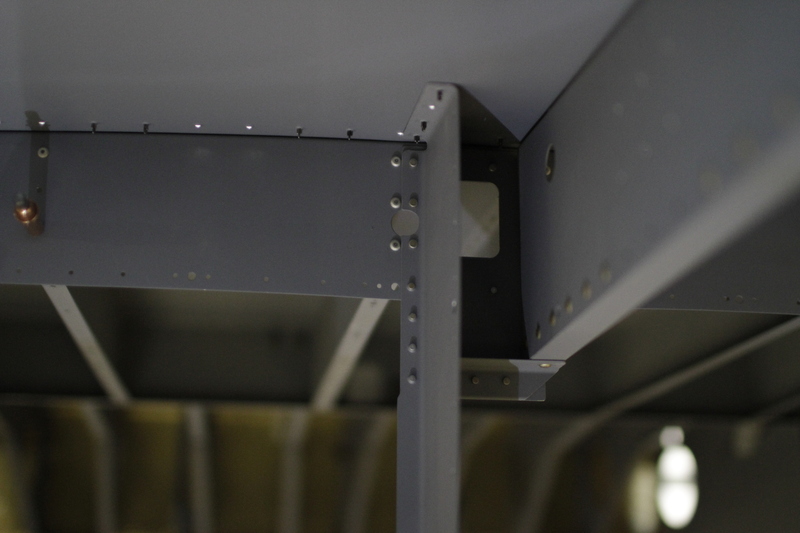 Here’s a couple of photos of the harder to reach rivets in the interior skeleton. 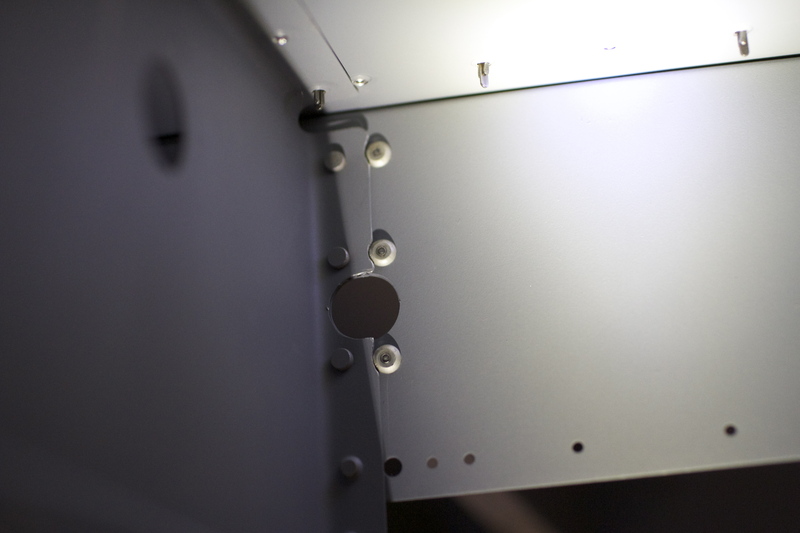 The top of the 715/705 rib interface and the bottom is the aft flange of the arm rest. 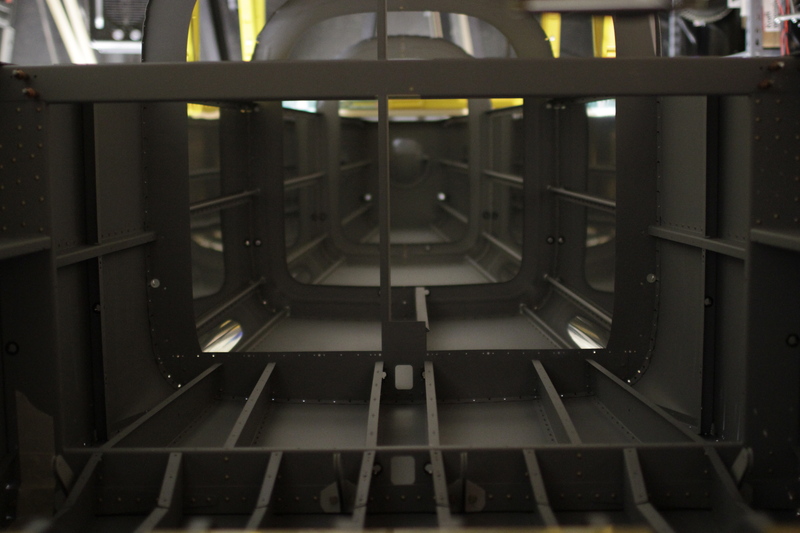 The fuselage is starting to look whole with less and less clecos attached! 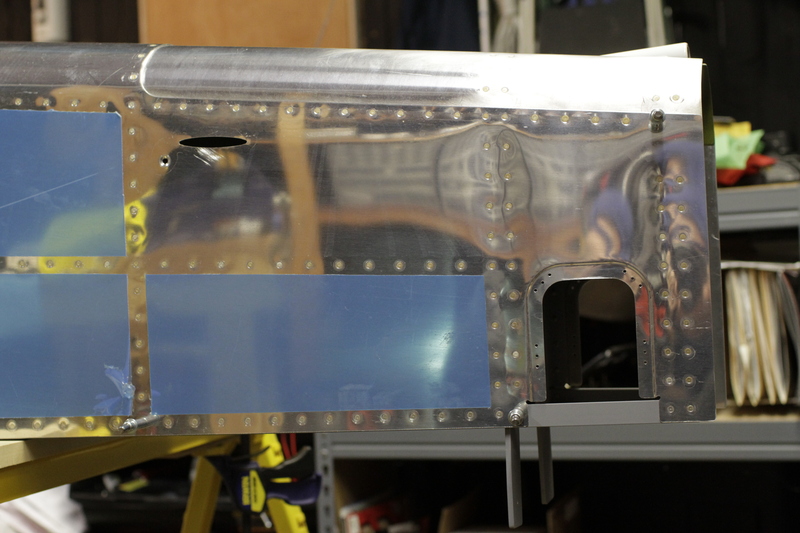 Hopefully, we can finish out the canoe riveting with one more major push next weekend. Don’t be fooled. I haven’t turned over the fuselage just yet. I simply flipped the photo so I could image the fuselage right side up for once. Today I took off from work and concentrated on the interior rivets I have left to complete. 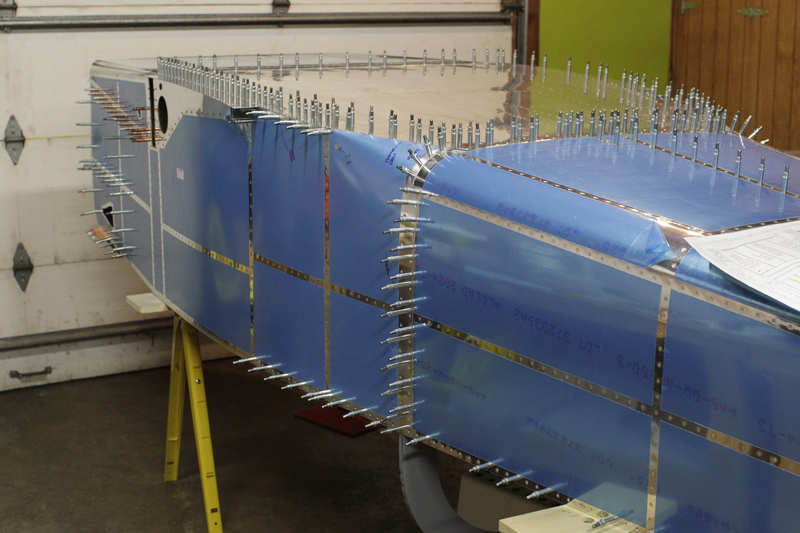 There’s the 18 rivets that connect 706 to the aft baggage ribs; 3 rivets connecting 707 to the bellcrank stiffener; 6 rivets for the aft arm rest and finally 4 rivets that attach the 715 ribs to the rear wing spar. I can’t get all of these by myself. But a number of them are in very close quarters and hard to buck anyway. 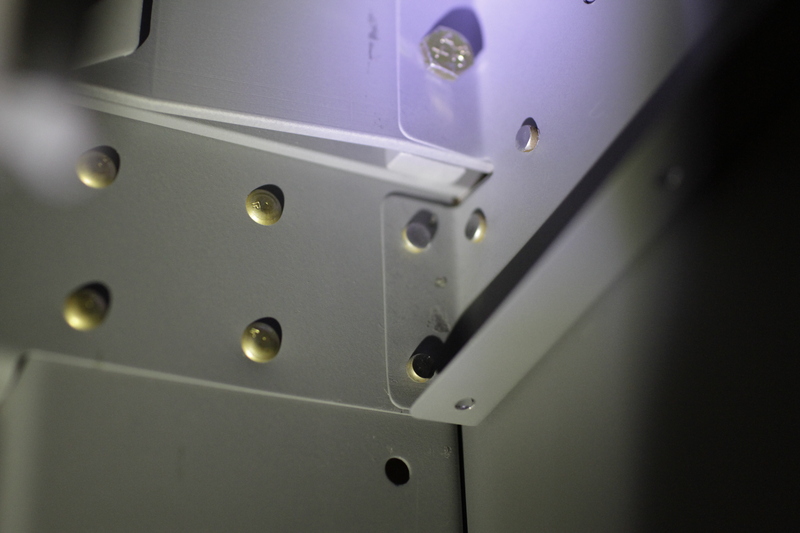 I am using cherry max 4-2 rivets for these holes and pulling them myself. Above you can see 3 cherry max’s used just to the left of the bellcrank support brace. 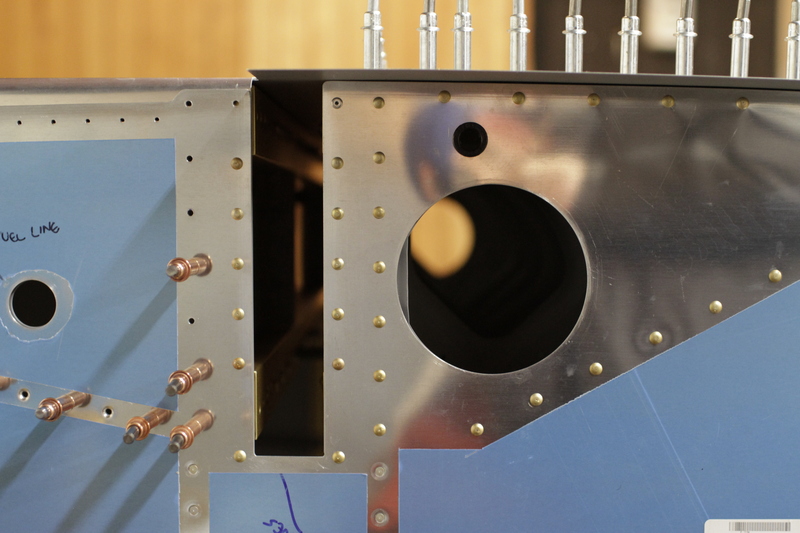 Also the lower-most hole (upper in the photo) in each of the baggage rib/706 intersections. On the opposite side of the bellcrank supports it wasn’t as straight-forward to pull those rivets. The flange of the bellcrank stiffener overlapped the holes for the 706/baggage rib rivets so that you couldn’t get the manufactured head to seat properly. Trying to pull from the other side would be much more awkward and the resulting shop head might not sit well with the overlapping flange. So I took out the dremel and CAREFULLY scalloped out the edge of the overlapping flange so that the rivet heads sat perfectly against 706. It all turned out well in the end. I set 11 cherrymax rivets leaving 16 more to buck when Paul comes over this weekend. 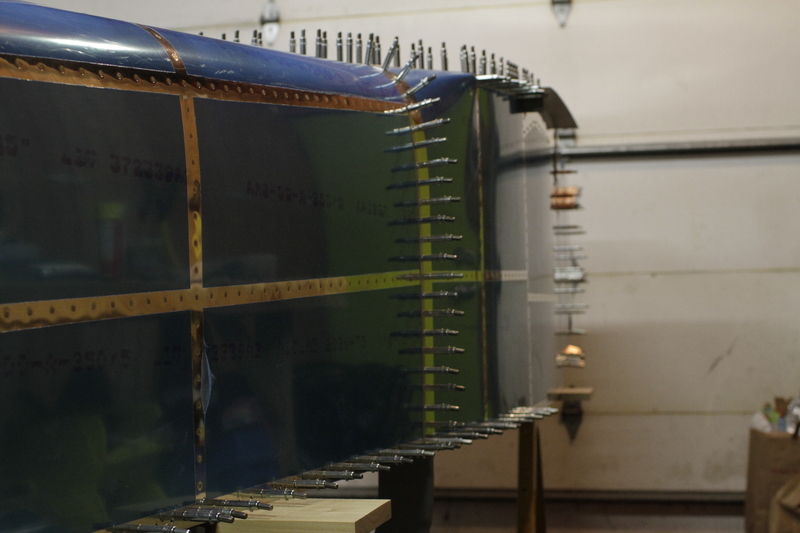 Today we started the final riveting of the main fuselage. Since I was delayed a week, I went ahead and set most of the longeron rivets called out in the Tip-up instructions using the squeezers. When Paul came over on Saturday, we began at the 704 spar and worked back and forward. 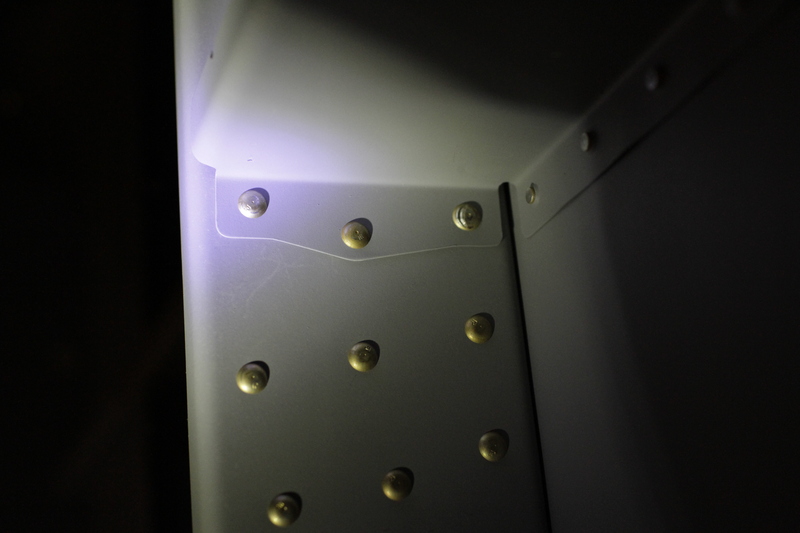 We also went back and finished out the rivets in the aft fuse we left open to fit the longerons in place. It had been a long time since either of us riveted so we took it slow in the beginning. In the picture above you can see a couple of clecos left in the longeron. I have a couple of mistakes to repair on the right flange tabs of 710 and 711 so I left those cleco’d until I flip the canoe later. 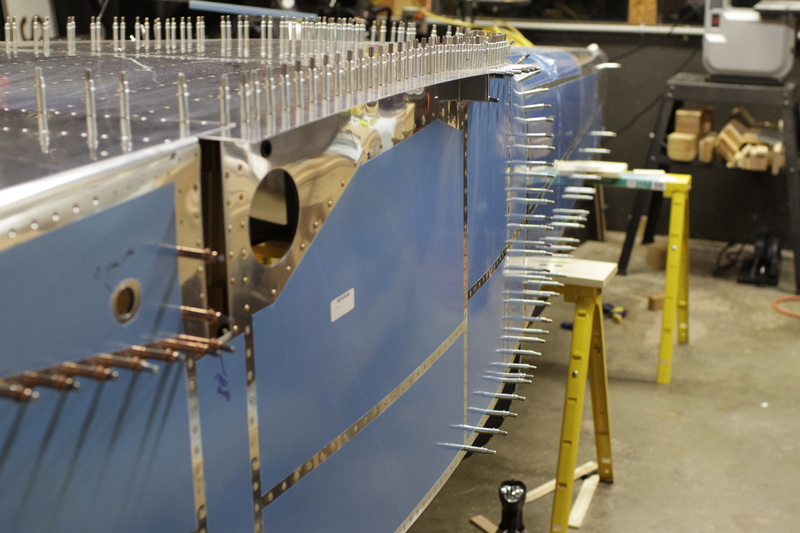 Here’s the 470 rivets for the 704 spar box and the 705 ribs riveted—mostly perfect. There were a couples of dings caused by the bucking bar slipping of the shop head. No biggie considering the wing will cover this whole area anyway. After 4 hours riveting plus an hour lunch we punched out for the day. I didn’t get as far as I hoped but glad just to get the process started. I couldn’t get help this weekend on the riveting front, but I did score a visit to another builder’s project. Chad is setting a wicked pace with his -7 project. Starting in 2009, he’s currently somewhere in the canopy fitting stage. Sunday afternoon I spent about an hour with him looking over his fuse, firewall, and panel choices. I got some great advice and “heads up” that should save some time and aggravation down the road. I’m really sold on fuel injection even though my engine purchase is at least a year away. I do have to start plumbing fuel and vent lines soon though and if I’m going with FI I’ll need to figure out the boost pump arrangement. Chad is going the same route so I got some great intel on the EFii boost pump mounting and the fuel lines/valve needs there. Also got good advice on seat back positioning (the Vans plan dimensions are off a bit), fuel return lines (not going to install any), figuring out the subpanel mod for the EFIS installation and much more. Thanks Chad! Hopefully I’m getting back to riveting this weekend. My body can’t take much more of crawling under this fuse!